I have been searching for some good free video format converters for a while. I have actually installed and tried in my desktop PC. The results were astonishing! Some of them do work better than the commercial ones. Most of them are based on the FFmpeg LGPL software and other open source utilities. FFmpeg is a great piece of software, but it contains only console commands and does not come with any fancy Graphical User Interfaces (GUI). Basically these freewares that I will initroduce act as a the front GUI for FFmpeg. So FFmpeg is not for a casual innocent PC user. I tried several freewares. Some are worthless to mention and some are very nice. There are the three finalists. This is probaly the most powerful video format converter with the every options that you will ever need. You can drag and drop the source files just like Any Video Converter. And you can play around with the option contol in the lower pane. Note that it shows nice little summery of the output file format and expected size if you click on the ‘Summery’ tab. When you’re done with changing the options, you click on the ‘Start’ Button to execute the conversion. The output file will be created in the same folder where the original source file is located by default. Here is the description from the website. When I tried to convert wmv to avi, it did work fine. But when I tried wmv to flv conversion. ffmpeg.exe has crashed and MediaCoder did not respond properly so I had to close it. Final Verdict: It’s OK if you want to control all the details of the output video. As I metioned in my article on creating a flv file, Any Video Coverter has pretty and easy to use interface. 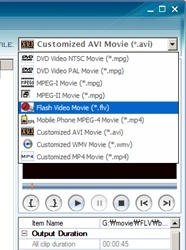 It says to support DVD (mpg), MPEG-I (mpg), MPEG-II (mpg), Flash Video(flv), mobile MPEG-4 (mp4), AVI, and WMV. You can cross convert any way you want among the mentioned endodings. 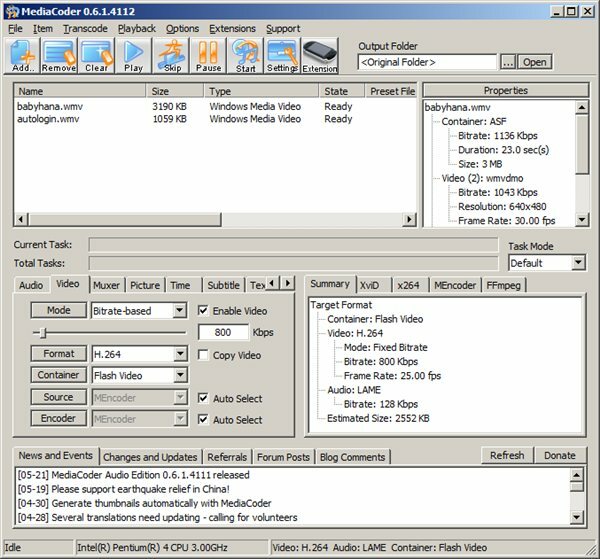 You can just drag and drop source files into the left large pane and select the target encoding types and optinally video and audio options (such as resolution and framerates) and click on the Encode button. Viola! and your done. Also it has a capability to convert video from YouTube directly and store it in to local hard drive in the format you want. When you first run the software, make sure to set the output folder by click on ‘File’ and ‘Set Output Folder’ menus. Whenever you convert the videos, the output files will be stored in this default Output Folder you define here. Make sure you check the output options everytime you run the software. These settings are memorized and loaded by Any Video Converter and will be used as default options. So when you set the output resolution very low the last time then you will end up with the low resolution again if you don’t change them properly. One thing I hated about this software is that whenever the conversion is completed, you get a popup dialog asking you to try pro version. But hey I can live with that. To Flv conversion: works great. When you run the app, you will most like to see this warning popup messages. It may say that few requirements do not meet. I got this impression that I may not be able to use this software, but please try . It usually works even it you see this warning messages. However, it seems that SUPER does use some large amount of computer memory during the conversion. The warning message says 176 additional free memory is required. SUPER supports lot of converting options , more than Any Video Converter, but less than MediaCoder. It supports various types of format including ususal WMV, MPEG, MP4, AVI, FLV, ASF, and so on. But this one supports output format of unusual ones such as MOV, OGG, 3GP,and more. Also , it has automode that you can convert files for iPod, Zune, Nintendo DS, and Sony PS3! That’s a great help! But unfortuantely I do not have any of those devices. If I had one, I could have done the testings. You should first select the output folder by right clicking and selecting ‘Output File Saving Management’. All the converted output files will be stored this default output folder. Now you are ready to convert some video files. First select the output file format you want. And optinally change the Video and Audio options. They fairly easy to change. Then drag and drop the source files in the lower pane. And finally click on the Encode Button. It appears little unstable even though it does the work. It seems that the SUPER uses up too much system resources during the conversion because I had hard time working with other softwares. Also the output data quality seems a little lower than what I defined in the options panel. I am not really sure. Some notes. I am telling you that I had difficult time to find the download link. I guess the creator wanted you to read what he has to say about the software and the introductions. When you visit the website, search for “downloading” keyword and it will bring you to the download link directly. Also, the main window automatically moved into the center of the screen whenever I changed the option or click buttons. That bugged me a lot. Final Verdict: Nice if you want support for uncommon formats or easy conversion for the other media divces. I hope this information helps you to end your quest for the free video conversion software , too. Thanks a lot for sharing your work. It’s very concise and useful.